In his article, BIM For Reinforced Concrete – It’s In The Details, Pawel Piechnick points to the delay in adopting Building Information Modeling (BIM) in the concrete industry, due mainly to the fragmented supply chain, involging the collaboration of several designers and suppliers for final product delivery. With varied demands coming from Autodesk users regarding BIM-centric solutions for concrete – gaining more engineering information while coordinating with local building code requirements (engineers and designers), maximizing production and delivery while minimizing time spent with detailing and coordination with the field (fabricators), and planning optimization through access to accurate quantities in early project phases (contractors) – it is becoming clear that the industry is ready for a big change. Pawel goes on to say that Autodesk’s strategy for reinforced concrete involves integrating steel reinforcement detailing with the structural design process, as well as the detailing process, resulting in more accurate documentation, as well as connected, end-to-end workflows. Autodesk Revit is a clear example, as a model authoring platform supporting BIM workflows for any discipline or trade. Autodesk’s strategy is completed by partnerships with technical partners who have a record in delivering rebar design-to-detailing-solutions for users in the concrete industry still working with traditional 2D CAD platforms. 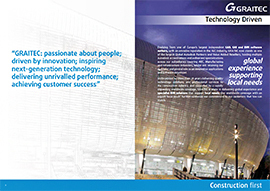 Software developers such as SOFiSTiK, aSa and Graitec are providing Revit based tools adapted to local standard requirements, process automation, and advanced productivity requirements, and are rebuilding on Revit so they can provide their customers and future reinforced concrete partners a more collaborative BIM environment. Carl Spalding, GRAITEC Product Strategy Director, thinks that the concrete industry is about to change “thanks to the global adoption of BIM, advances in software technology and countless lessons learnt”. and increasing transparency and model information quality from bidding to procurement.